Following years of controversy, the proposed Carmichael coal mine funded by Indian industrialist Guatam Adani is set to start operations before Christmas. It’s not going to be the mega-mine that was initially proposed, however the mine in North Queensland’s Galilee Basin will still have dire and irreversible environmental consequences. It’s no secret that coal-burning is one of the biggest drivers of climate change. Many believe that Australia one of the ‘better’ countries when it comes to the fight against global warming. But in fact, Australia is the largest coal exporter in the world; 36.6% of total coal exports to be exact. The initial mine will be quite small. But Adani claims it will “ramp up” coal output to 27.5 million tonnes a year. It also paves the way for other Galilee Basin projects, including the China Stone Project and the Alpha North; both of which would greatly surpass the size of the Adani mine. Why has the proposed Adani coal mine become such a contentious issue? Due to the enormous scale of the proposed mine and its impacts on the environment, it has been opposed with the largest environmental campaign in Australia since the Franklin Dam controversy in the 80s. It also comes at a time when the world’s climate scientists are warning that catastrophic climate change can only be avoided if the world limits its use of coal. Furthermore, with the extremely urgent challenge in transitioning to a low-carbon society, it’s hard to justify a new coal mine that would contribute to the worsening effects of climate change. 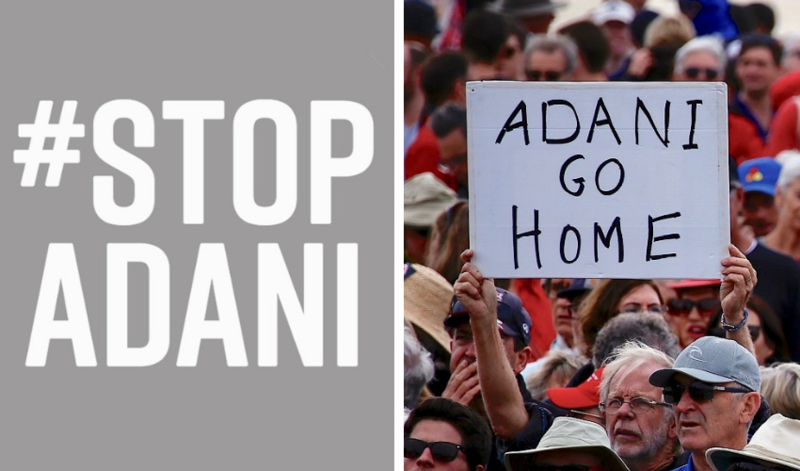 #STOPADANI protestors outside Parliament House – image via SBS. If the smaller Adani coal mine goes ahead, will it still have negative environmental impacts? Despite being approved for the development of a mine roughly half the size of the initial proposal, there’s still a strong chance the mine will increase in size and have terrible consequences for our climate, local water sources and threatened species. CLIMATE: The Adani coal mine is set to produce 2.3 billion tonnes of thermal coal in its 60 year project lifetime; generating an estimated 4.7 billion tonnes of greenhouse gas emissions. This goes directly against the UN’s Intergovernmental Panel on Climate Change (IPCC) report that said global emissions of greenhouse gas pollution must reach zero by about 2050 in order to stop global warming at 1.5 degrees Celsius. GREAT BARRIER REEF: The shipping of the coal is dependent upon the shipping port at Abbot Point, which requires dredging the seabed. Dredging also releases fine sediments, which would reduce water quality and smother nearby coral reefs. Not to mention the long-term damage to the climate; the GBR is expected to decline by around 70-90 percent under the 1.5C change, but that may rise to 99 percent reef loss if the temperature hits 2C. ARC Center of Excellence for Coral Reef Studies director Terry Hughes contributes the eradication of the GBR to the continued use of fossil fuels – full interview here. “But the federal government of Australia, like the federal government of the United States, still very much favors the continued development of the fossil-fuel² industry, and that, to me, is a complete policy failure for the Great Barrier Reef,” Hughes said. Great Barrier Reef coral bleaching – image via Climate Council. DEPLETION OF WATER SOURCES: Adani was granted unlimited access to precious groundwater by the Queensland government for the next 60 years. According to #STOPADANI, the proposed Adani mine will drain at least 270 billion litres of groundwater over the lifetime of the mine. Furthermore, it will dump polluted wastewater into the Carmichael river and threaten local ancient springs that are sacred to the Wangan and Jagalingou traditional owners. These springs are also paramount in times of severe drought. It’s clear that while the rest of the modern world is attempting to move forward to a cleaner, more sustainable future, Australia still places the profit of a finite source over the welfare of future generations. It’s obvious that the Adani coal mine is symbolic of the precipice in which Australia now stands upon; do we continue to spiral down into a world where profit is more important than our precious ecosystems and future generations? Or, do we take a stand and become a leading example of sustainable practices for the rest of the world to emulate? Previous ‘No fear, no pain’: What really happens to livestock when they leave Australian shores?